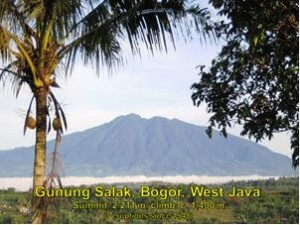 Gunung Salak lies directly behind Bogor and is easily accessible from Jakarta via the Ciawi-Sukabumi road at Cicurug. Salak has seven peaks with the true summit, known as Salak 1, at 2,211 m. The entire mountain is forested which limits views from its peaks. In May, 2012, a plane, on a demonstration flight from Jakarta, crashed into the western slope of the mountain. 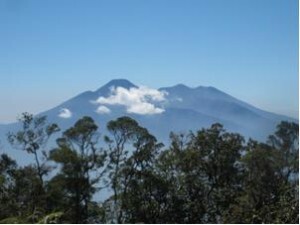 For recovery purposes, the summit was cleared of trees and now offers good views of the Pangrango-Gede complex to the east and of Halimun to the west. The Gunung Salak-Halimun National Park was established in 1992 with a forest corridor linking the Salak and Halimun mountain complexes to extend the range of the endangered Javan Gibbon and other wildlife. Folk lore tells of birds flying over Salak ‘falling out of the sky’. Plane crashes on the mountain over the years have reinforced this folk lore. Campers are reported to have died in their sleep usually attributed to poisonous gases emitted from craters. Salak offers various treks all of which can be done in one day with very early starts, like 0400 hrs, from Jakarta. Three treks are mentioned below. A full day’s ration of water should be carried on all treks. Java Lava provides specific instructions on how to reach the respective trail heads in its Circulars. Traverse to the summit of Salak with descent to Cimelati. The ascent is about 1,400 m and about the same on the descent. The trek is quite long and tough; recommended for fit climbers only. The trail is reasonable but in parts steep and can be muddy. 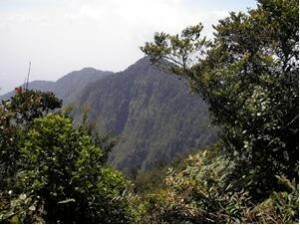 The trek offers great views of the Queen’s Crater as well as of the Gede-Pangrango and Halimun complexes from the summit. Hike to Kawah Ratu (Queen’s Crater): the distance is about 5 km one way, with return time to Javana Spa about 5-6 hours; suitable for families/children. This is a very interesting area with two related craters shown as Paeh (‘death’) and Hurip (‘life’). The area is full of volcanic activity – fumaroles, steam, sulphur emissions, hot water streams and more. The last eruption was in 1935. Stay on the sign-posted tracks to avoid poisonous gases. This is a variation on the Traverse with the climb leading direct to the summit. The start and finish are by the same route at Cimelati. Cimelati is reached via a road just before entering Cicurug. The climb starts at around 800 m making for a sustained, steep, but direct climb to the summit in 4-5 hours; medium-level trekkers including older children. 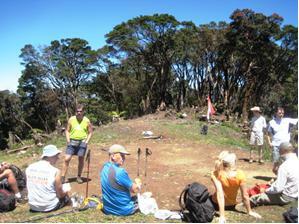 With a 0600 hrs start, and plenty of time at the summit, the group should be down again by mid/late afternoon. Suitability: the routes described above are quite strenuous for a long one-day trip. Good fitness, some experience; not suitable for families and children. If doing the Javana Spa climb, the return trek to/from Kawah Ratu (Queen’s Crater) would be suitable for families and children.